Summer fun is in full swing, and many families are hitting the road and sleeping under the stars. According to recent data, a whopping 2 million Taiwanese are camping enthusiasts, and they form a market worth over $5 billion Taiwan dollars a year. This summer, entrepreneurs are hoping to seize market share with some highly innovative offerings, including a tent that can cool its interior by up to 5 degrees Celsius. Taiwan is in the throes of a camping craze as more and more people are discovering the fun of being close to nature. Entrepreneurs are offering some unique gear: temperature-regulating tents that give its inhabitants a comfortable night’s sleep even in the summer heat. From the outermost coating to its inner padding, this tent is made with pure cotton. It has excellent ventilation, plus a floor-to-ceiling door– it’s a one-piece floor-to-ceiling door. As a result, the air convection is extremely strong and can have a cooling effect inside the tent.Ingeneral, the temperature inside can be up to 5 degrees lower than the temperature outside. 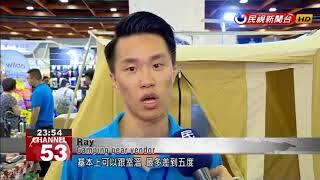 Entrepreneurs are upbeat over the camping equipment market, expecting it to be worth NT$5 billion a year. They’re also filled with creative ideas on camping-related accessories. One innovation is this stainless steel 24-hour cooler, which can be injected with carbon dioxide. Barbecue grills don’t get more minimalist than this. This grill constructed with cardboard is topped with charcoal and volcanic rock. Simply light the charcoal in the four corners and the grill will start up, rising to 450 degreesCelsius in 10 minutes. Once you’re finished cooking, bury it in the dirt and it will naturally decompose. And finally there’s this wristband that could save your life. Using liquid carbon dioxide, the wristband will release and inflate a flotation device in five seconds, providing a lifeline to a distressed swimmer.